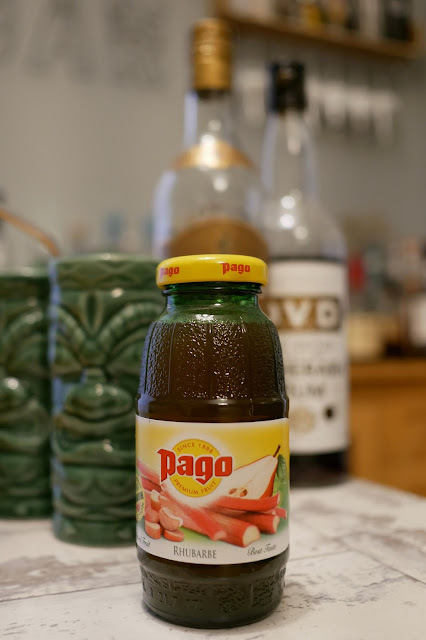 I have a bit of a confession to make, a confession of an addiction - I have 100% become addicted to this rhubarb juice from Pago. I thought their cloudy cherry juice, found on the shelves of a couple of the local cafes near my house, was the greatest thing I'd drunk in a long time, but then this rhubarb and pear turned up on my doorstep and my tastebuds were corrected! 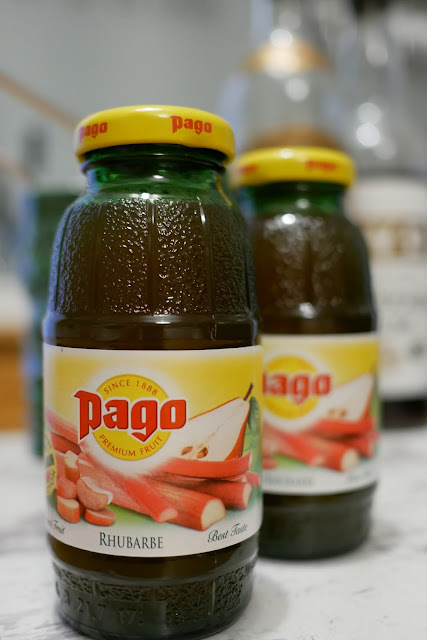 When pago got in touch saying that they'd like to send me some juice, I said yes, because they are donating a percentage of the money from the sales of their drinks in Sheffield to Weston Park Cancer Hospital, which is where I had my radiotherapy. I also said I'd try and think of a fun cocktail to make with it too. Which lets face it, is a really tough gig to agree too. 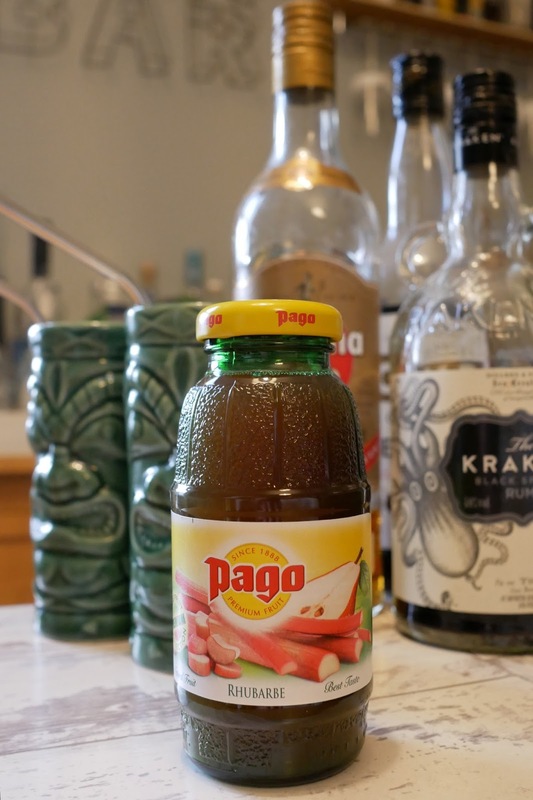 So, over a month or so, Jim and I set about trying the Pago in various spirits. We had it straight up with vodka - which works well, we tried it with gin - again, pretty nice, but it was only when we tried it with rum that we knew we'd found our winner!Jim is the master cocktail maker in out house, and one of his specialities is the Zombie, so as soon as this was suggested, I knew it'd be delicious! I should give you fair warning though, if you're not already a fan of these ad boys - a Zombie is one hell of a drink - it's got a LOT of rum in it, which I think is great, but you know, isn't for the faint hearted, and it's never a good idea to start an afternoon of fun with your friends by ordering one - no matter how panicked and flustered you are at the bar! There are two ways to make a Zombie - one is built, and mixed in the glass, the other is to blend the ingredients together. The blender vesion seems less harsh, but it's up to you how you mix it. In bars you'll mostly get them 'built' but at home Jim has been known to do them both ways! 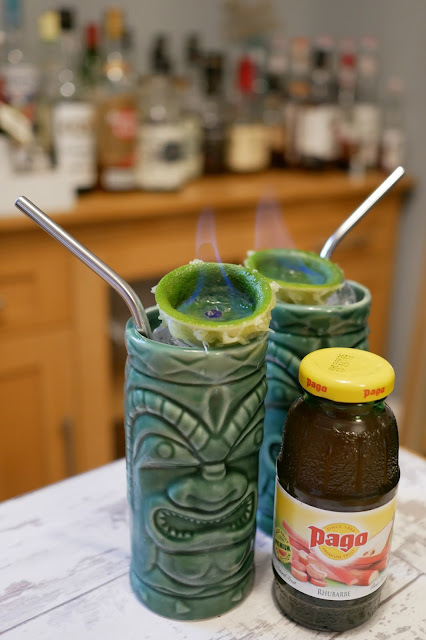 To blend, add all the liquids to a blender, with some ice, and blitz it up until combined, then pour it into a tiki mug. 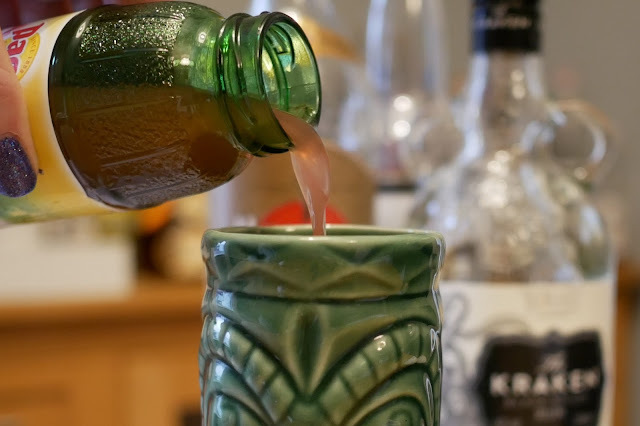 To build, pour the dark and golden rum into a tiki mug, over ice, add the Rhubarb Pago, and stir. Finish the drink by floating your overproof rum on the top of the drink. Now comes the fun bit, setting light to your drink.....Our local always serves your Zombie flaming, and I tried to find someway of using rhubarb or pear as the flame vessel, but it wasn't a great idea, so let me save you the hassle and say, do it the old fashioned way, grab yourself a inside out half lime, fill it with a dash of the overproof rum, and light it. But don't let it burn out, just coo at the flame, then blow it out and tip that rum into your drink, or it's a waste!